In 1967, Capitol Records made a limited edition modified version of The Beatles “Sgt. Peppers Lonely Hearts Club Band” album cover art. 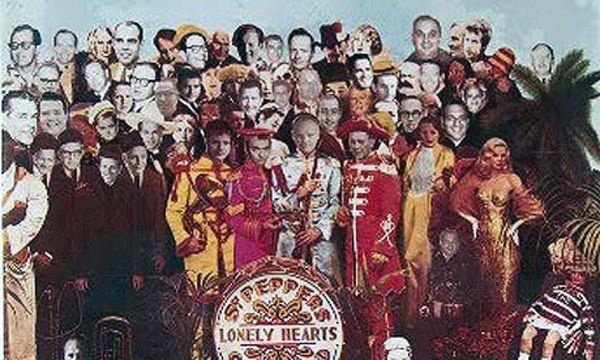 The limited edition album cover (thought to be only about 100 made) features the faces of executives from The Beatles American record label Capitol Records. The Beatles faces do not appear in the revised artwork and a total of 40 of the faces from the original album cover were replaced. This special version was made as a gift to employees of the label in 1967. Only three copies are currently known to exist. Record Collector magazine just named The Beatles – ‘Sgt Pepper’s Lonely Hearts Club Band’ (limited edition Capitol version) the most expensive record sleeve of all-time. It’s currently valued at around $112,000 (£70,000).